I’ve been asked a few times recently about how I draw isometric buildings. Here’s the run down. Use some rectangles to get an interesting floor plan. Don’t go crazy, but don’t just do a single rectangle – that leads to dull uniform buildings. Spin the shape around by 45 degrees (or a random amount if you want less exactly isometric buildings). Then shrink vertically by 57.7%. On a new layer, using your base as a starting point, ink in the outline. Begin with the vertical walls – remember holding shift in your program of choice will likely force the line to stay perfectly vertical (it does in photoshop and gimp). Outline some roof lines, and ink along the leading edge of the base (easy to forget). This step is key as it’ll determine whether the shape is believable or not. For diagonal lines, use the diagonals of the base as a reference. You want to follow that angle as closely as possible with your other diagonals or the shape will look wonky. You can also use an isometric grid layer to guide you – here’s a handy grid you can import as a background layer. Remove the base layer (the filled shape), and create a new layer. On this layer start adding details. Begin with the big pieces – doors and windows. If you have a repeated shape (multiple similar windows), draw it once, then copy and paste that element multiple times. They should be exactly the same, so make them exactly the same. For elements that are inset, make the line weight of the edge further away from you heavier. This make it look like you’re seeing the inset wall on the far side. When adding features, add a few that break up the silhouette of the building. Here I’ve added some roof windows and some crenellations. Once you have the structural doors and windows, it’s down to textural detailing. I’ve added stones to the walls, and tiles to the roof. These will also follow diagonals – so they really help to sell the isometric perspective (but remember, you really need to follow the correct diagonal – it takes practice, but it’s worth it). I also added a flag to the tower, for fun, and as a place to add some un-expected colour. And some lines to indicate the surrounding terrain, including a couple of lines leading up to the door. There you have it, a nice line art building. Zoom out to 1/3 the size, and it’ll look great! Here’s the full resolution image, and the raw .psd so you can see how the sausage was made. 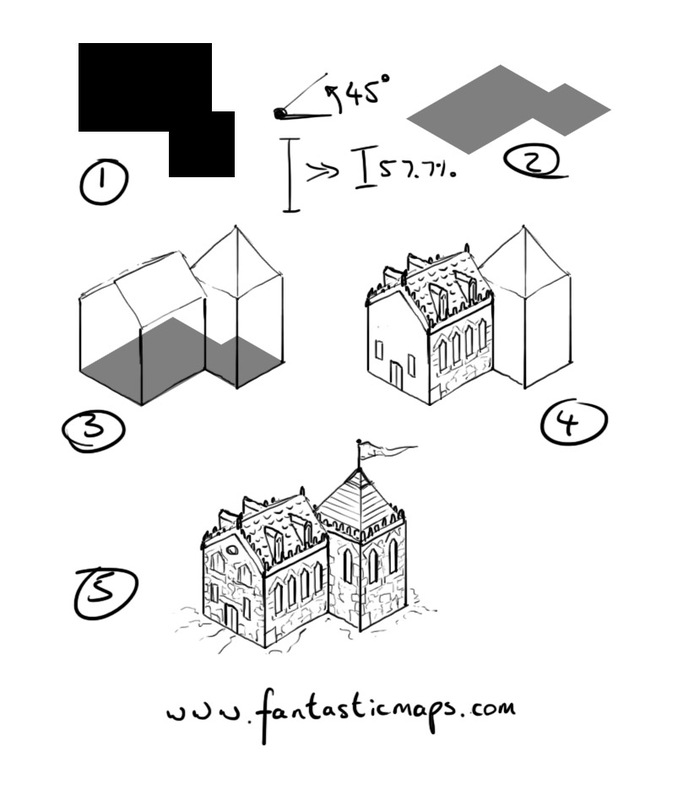 All the rest of my tutorials on mapmaking can be found here. Yes. There’s always that risk with these kinds of tutorials. The tips should be a little more useful. Of couree they are, but for someone with zero graphical talent it remains daunting. if you ever need code written though, get in touch! Would love a code-for-art programme. This is not a tutorial. This is an explanation of what is a drawn isometric house. There’s a little of the ‘how to draw an owl’ here, I agree. But I would hope there’s enough tips in the text to qualify as a tutorial. Perhaps a few more steps between 3 and 4 would help. That’s fair. It’s a bit of a leap. I learned to draw isometrics in Drafting Class in 1974, before CADCAM. So “spin to 45” and “shrink vertically by 57.7%”, and “layers” might as well be in Klingon to me. To draw an isometric pre-CADCAM, all you need is paper,a T-square (to establish a consistent horizontal), and a 30/60/90 triangle. The ground plan is done on 30-degree angles from the horizontal; Z-axis (elevation) at a 90-degree angle/true vertical, and all measurements are 1:1 true along those angles. That’s how I learned to do it too – on a drawing board with a horizontal rule, set on wires. Photoshop just added digital wires. Where does 57.7% come from? That’s the vertical conversion needed to turn a 45 degree line into a 30 degree line. It comes from tan(30 degrees), which is the ratio of the vertical edge of the triangle over the horizontal line. I want to add a tip here for photoshop users. You need to apply the angle transform first, then separately apply the 57.7% second. 1) Create the floor plan. 3) Transform the floor plan (Ctrl+t to start the transform), change the angle in the tool preferences toolbar to 45 degrees. Press Enter TWICE to apply the transformation. 4) Transform the floor plan a second time (Ctrl+t), change the height (H: 57.7%). Press Enter twice to apply the transformation. When I first did this I applied each transform and it worked. Then I went back and tried to do it a 2nd time and it wasn’t working because I was trying to change the angle and the height in the same transform. Previous Previous post: Where is Valyria?